The primary purpose of the Panther Athletic Club is to aid Georgia State student-athletes through scholarship, facility enhancement and other programmatic needs support. Scholarship costs for the 350+ Georgia State student-athletes have surpassed $5.7 million annually. We need your support to help provide these young men and women the invaluable academic, athletic and social experiences that Georgia State has to offer. 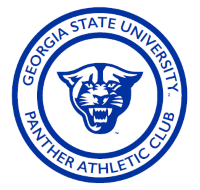 All Panther Athletic Club membership gifts are processed by the Georgia State University Foundation. Should you have any questions on how to complete this form, you may call 404-413-4126. Thank you for your support to grow the Panther Athletic Club to 2,000 members and beyond! * All who join at Teammate level ($100) and above receive joint membership with the Georgia State University Alumni Association!